A viral video shows two Oklahoma students in an altercation that resulted in one knocking off the other’s “Make America Great Again” hat and grabbing his “Trump 2020” flag, the Edmond Sun reports. The filmed incident resulted in Kenneth Dewayne Jones, an 18-year-old Black student, being issued a municipal court summons for assault and battery. 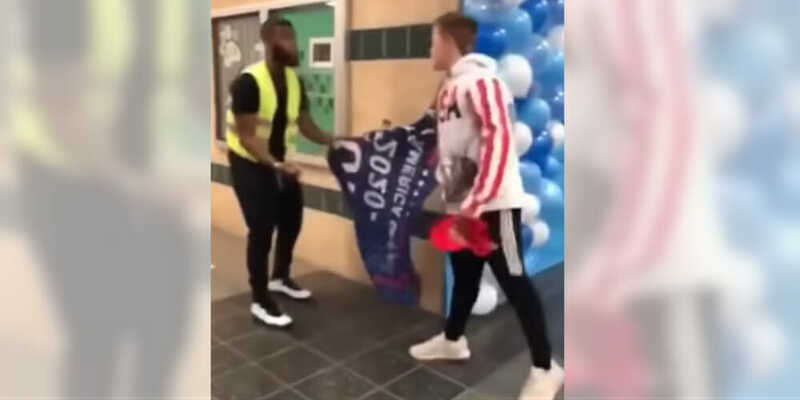 “Take it off or I’ll rip it off … do you want me to rip it off?” Jones can be heard saying to the white student who was wearing the Trump flag as a cape. Jones can then be seen knocking the hat off of the student and grabbing the flag. A third student can be seen trying to mediate the situation. The students attend Edmond Santa Fe High School. The incident occurred during the school’s week-long fundraising effort, during which students were able to wear hats. “On the 25th, students were allowed to contribute a dollar to the fundraising cause in exchange for a pass to wear headgear to school, which is typically not allowed in school facilities during the school day,” school spokesperson Susan Parks Schlepp told the Edmond Sun. Schlepp said that the student did not violate the school’s dress code by wearing the MAGA hat. But, she said, Jones violated the school’s discipline policy by knocking the hat off and grabbing the flag. Jones was issued the summons by a school resource officer, according to the Edmond Sun, but he had not been officially charged. A spokesperson for Edmond police said that the family of the other student had five days to take action by meeting with the city attorney to move forward with the assault complaint. Jones told KOCO 5 that he plans apologize for the incident. The family of the other student said it intends to pursue criminal assault charges.